What is 4MAT?A method for appealing to all learners. 4MAT 4 Algebra is founded on ten over-arching ideas that establish the conceptual glue for the teaching of Algebra I. The program is based on the research-proven 4MAT method. Students will never feel they are learning because "it's on the test." Every concept begins with student's own experiences and ends in adaptation of learning. Each unit plan is taught over a 2-3 week time frame. Each unit connects to the real lives, interests and experiences of students. And each unit also provides actionable ways for students to make learning their own through individual applications and extensions of knowledge. 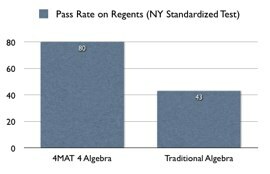 Hear from school teachers and administrators about the success of 4MAT for Algebra for their students. View the most frequently-asked questions concerning the 4MAT for Algebra Teaching Method. Click here to download or receive by mail a sample chapter from the teacher's guide. The concept is "Luck". 4MAT 4 Algebra training training is for teachers looking to use this program in their classroom. The training provides comprehensive guidance in how to use 4MAT 4 Algebra to help enhance Algebra I Instruction. This training includes 2 days of intensive instruction on how to use this program in the classroom. Participants will receive hands-on guidance in all the instructional activities and projects comprising the course. Upon completion, participants are fully equipped to implement this program in their classroom. Watch for future 4MAT 4 Algebra workshops to be scheduled.